Why does a Cancer institute need a User Experience lab? Simply put: To learn about their customers—people living with cancer and those who care about them—and build the best possible products with them in mind. “Cancer has a journey and we wanted to create a lab to capture the substance of that journey, understand what is needed and help design technologies to support people affected by cancer,” said Silvia Inéz Salazar, an Informatics Research Laboratory Manager at the National Cancer Institute (NCI). Their new lab, officially called the Audience Research and Informatics Laboratory, was completed in August (and keep reading to find out about their Open House Sept. 11). It’s a dedicated space to collect data on the customer experience of many of the digital services that NCI provides, including websites, mobile sites, apps and other systems. 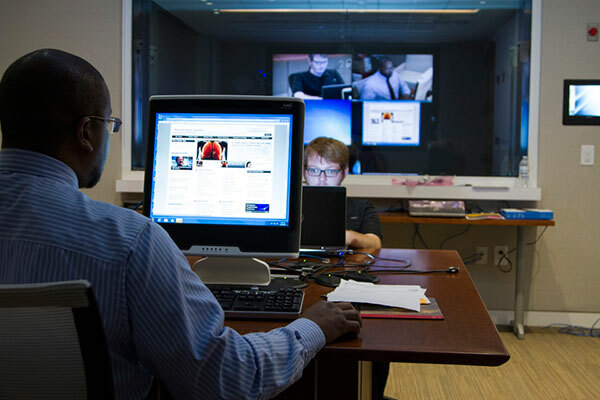 The lab is complete with modern equipment allowing for a variety of user research: eye-tracking studies, usability testing, in-depth interviews, testing of printed materials and more. It resembles the type of modern user research lab you might see in any major university or large corporation, and joins at least five other federal usability labs in the Washington, D.C., area. “User Experience (UX) is a tool agencies can use to learn about the needs of the audiences and communities we serve,” Salazar said. The lab helps her and other project leads, information architects, Web developers from across the agency design tools that are built from the perspective of the end user. This results in fewer changes needed once the product is launched, higher customer satisfaction and lower development costs. It’s their second lab—the first was built in 2002, but when they moved to the Medical Centre on the Shady Grove Campus, a new one was needed. In addition, the equipment in the old lab was outdated and many components simply did not work. For example, the audio completely malfunctioned, cutting observers off from crucial feedback. 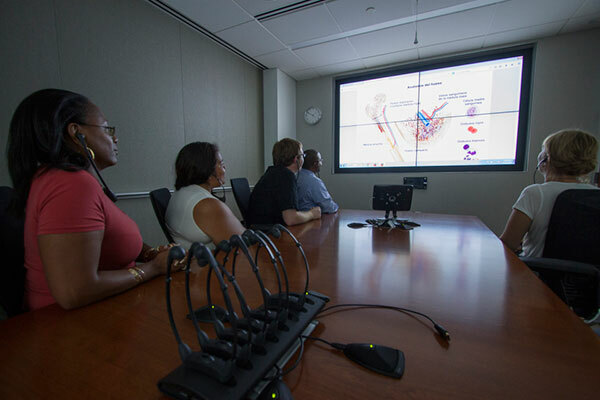 The new lab sports a large LCD screen with four desktop screen sharing, and a separate room for the facilitator to observe the ongoing studies. From there, observers also can watch without interrupting via a one-way mirror. They are able to conduct UX research in multiple languages, including Spanish, thanks to simultaneous interpretation devices. The room’s tech specs can be changed with a press of a button depending on what types of user needs they are researching that day. “One of the benefits of conducting UX over the last 10 years has been the ability to understand how the needs of a given audience evolves according to their experience with cancer and the changing technology environment,” Salazar said. For example, she said, when a person is diagnosed with cancer, they are immediately looking for information to understand their diagnosis. During treatment, they like to use mobile devices while they are sitting in the treatment waiting room. Once they complete treatment, they are most interested in long-term side effects and how to improve survivorship. While the majority of work is done to address the needs of people affected by cancer, their work is not limited to cancer patients. They also reach out to researchers, scientists, grantees, caregivers, healthcare professionals, health educators, and people who want to know about cancer. They hope to continue their well-known “Open Call Testing”—where up to four sites receive usability tests in a single day—in the future once the lab is fully operational. The lab will be having an Open House on September 11, from 11:30 am to 4 pm. The lab is located in rooms 2E-202 and 2E-206 on the National Cancer Institute’s Shady Grove campus, 9609 Medical Center Drive, Rockville, MD, 20850. Please email Silvia for details at salazarsi@mail.nih.gov. Pooja Sawant is in her second year at University of Maryland, College Park, earning an MS in Information Management. She just finished interning with the DigitalGov User Experience Program at GSA this summer.